Ranveer Singh is currently going through a purple patch as he will be getting married on November 14 and November 15 to Deepika Padukone. On the work front, his next theatrical release ‘Simmba’ is already creating buzz as it is the first time he is uniting with director Rohit Shetty. Rohit Shetty’s another hit franchise ‘Golmaal’ has become a cult of some sorts and it comes as no surprise when the cast of ‘Golmaal’ i.e. 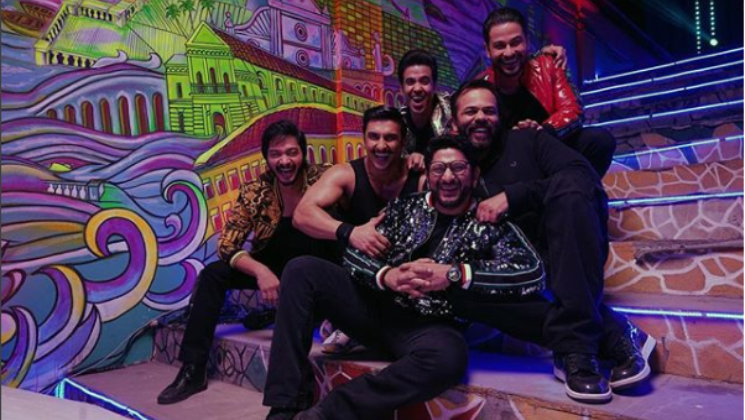 Kunal Kemmu, Tusshar Kapoor, Shreyas Talpade and Arshad Warsi decided to drop in a for a special cameo for ‘Simmba’. The ‘Padmaavat’ star also shared a video clip of the same and captioned it, “Everything’s gone a bit #Golmaal !!!. ‘Golmaal’ franchise already has four instalments and it re launched the career of Rohit Shetty as a director. His next will again be super fun to watch as Ranveer is a live wire and believes in giving 100% all the time. The film also stars Saif Ali Khan‘s daughter Sara Ali Khan, whose other film ‘Kedarnath’s teaser has taken internet by the storm. How would the combination of Rohit Shetty and Ranveer Singh pan out is still getting everyone curious. However, one thing is for sure that you will have to expect the unexpected. ‘Simmba’ releases on December 28.